Hey Girl Scouts! We LOVE seeing acts of kindness… and we know you do too. Help us say #GSthankyou to those who are bringing joy to their communities by giving them a package of Thanks-A-Lot Girl Scout Cookies. Pick up a free ‘Kindness Pack’ (a case of Thanks-A-Lots) at the Sacramento Regional Program Center or Modesto Regional Office. Put on each package of cookies a provided sticker that includes a simple thank you note. 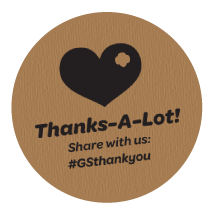 Share the kindness by uploading a pic to social media and using the hashtag #GSthankyou. Available now through July 31 (while supplies last). Questions? Email us at hello@girlscoutshcc.org. Next Post Tales From Camp: Lead On, Leaders!